Southeast Georgia counties have seen a lot of rain this summer and that means a higher risk for mosquitoes that can carry diseases such as West Nile Virus (WNV) and Eastern Equine Encephalitis (EEE). Coastal Health District officials want to remind residents to take steps to avoid mosquito bites and prevent mosquito breeding. WNV can cause mild to serious illness. According to the Centers for Disease Control and Prevention (CDC), about 80 percent of people infected with WNV will not show any symptoms at all; about 1 in 5 people who are infected develop a fever, headache, body aches, joint pains, vomiting, diarrhea, or rash; and about 1 in 150 people who are infected develop a severe illness such as encephalitis (inflammation of the brain) or meningitis (inflammation of the membranes surrounding the brain and spinal cord). Mosquitoes that carry the West Nile Virus are more likely to bite during the evening, night, and early morning. EEE is a mosquito-borne virus that causes swelling of the brain. In horses, it is fatal 70 to 90 percent of the time. Horse and large animal owners are encouraged to vaccinate their animals against the virus and to clean out watering sources, such as buckets and troughs, every three-to-four days to prevent mosquitoes from breeding there. EEE is rare in humans; however, humans are susceptible to the virus. According to the CDC, most people infected with EEE do not show illness. Symptoms in severe cases of EEE include a sudden onset of headache, high fever, chills, and vomiting. The primary mosquito that transmits EEE breeds in freshwater swamps. One of the best ways to prevent mosquito breeding and the spread of mosquito-borne viruses is to get rid of standing water around the home and in the yard. Residents are urged to clean up around their homes, yards, and communities and get rid of unnecessary items that can hold water and turn into mosquito breeding grounds by using the “Tip ‘n Toss” method. After every rainfall, tip out water in flowerpots, planters, children’s toys, wading pools, buckets, and anything else that may be holding water. If it holds water and you don’t need it (old tires, bottles, cans), toss it out. It’s also a good idea to change water frequently in outdoor pet dishes, change bird bath water at least twice a week, and avoid using saucers under outdoor potted plants. For containers without lids or that are too big for the Tip ‘n Toss method (garden pools, etc. ), use larvicides such as Mosquito Dunks© or Mosquito Torpedoes© and follow the label instructions. These larvicides will not hurt birds or animals. In addition, clean out gutters, remove piles of leaves, and keep vegetation cut low to prevent landing sites for adult mosquitoes. Homeowners associations and neighborhoods, along with city and county governments, are encouraged to sponsor community cleanup days. Controlling the mosquito population has to be a community-wide effort. If we all do our part to remove places where mosquitoes can breed and take precautions to prevent getting bitten by mosquitoes then we can lessen the risk of getting mosquito-borne diseases. 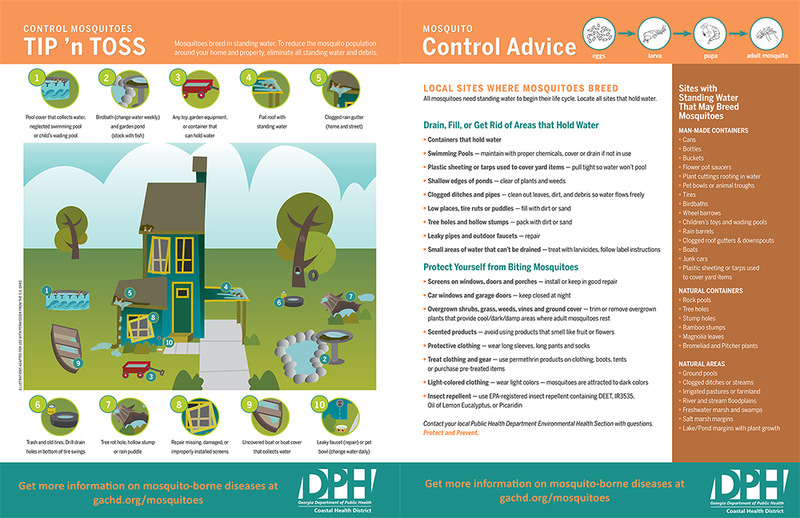 For more information on mosquito-borne illness and mosquito prevention, click HERE.